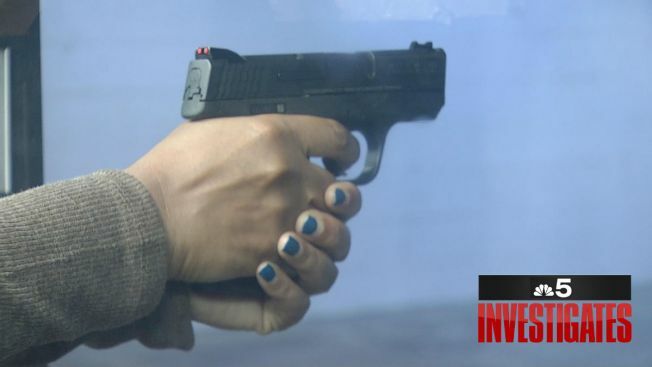 On a recent night several women, whose last names we are not using, found themselves at an Oak Lawn gun range, surrounded by other “Ladies of Steel” bound by a desire to learn how to handle and fire a weapon. Carol Marin reports. Deboree never thought she would own a gun, until, “I had an incident where I didn’t feel safe,” she said. Firearms have always scared Toni. And now? “It makes me feel a little bit more secure when I’m by myself,” said the new owner of a 9mm pistol. On a recent night both women, whose last names we are not using, found themselves at an Oak Lawn gun range, surrounded by other “Ladies of Steel” bound by a desire to learn how to handle and fire a weapon. Once a week the women gather in a small storefront. Currently there are 44 women, ages 30-to-80, who learn how to defend themselves with and without a gun. “It’s like girl power,” Dunagan said, “it’s like a support group. It really is.” The women come, she said, motivated by the violence in Chicago. They have secured their Illinois Firearm Owners Identification card and most have a conceal and carry license. 47,566 (18%) were issued to women. In Chicago 29,938 conceal and carry permits have been issued. Of that number 5,460 (18%) are women. Among them is Shirley, who has lived in her South Side neighborhood for 20 years. In class, the women learn how and where to carry their weapon. In an interview on the front stoop of her home Bond, wearing a Ladies of Steel blue denim jacket, said she would never carry her weapon in her purse. Ask the women what they get from the gun club and almost to a person, the word they most often use is empowerment. “Because I am in control of my situation, well I hope to be able to be in control of my situation,” Deboree said. “We are in control of the guns. People only get hurt by the person that is behind it,” echoed Toni. The most recent trip to the gun range came just days after the mass shooting in Las Vegas and as the issue of stricter gun control laws once again became part of a national debate. But could these women, if they were forced to, shoot not a target but someone who threatened their own life? “God forbid I definitely don’t want to kill anyone but I don’t want anybody killing me either,” said Shirley. “To be truthful, I don’t know,” admitted Deboree. But being prepared, said Dunagan, is a part of what these women are learning. As to the ultimate question?